The Hopi are a Native American nation, the westernmost group of Pueblo Indians, who primarily live on the Hopi Reservation in northeastern Arizona. The reservation is surrounded by the Navajo reservation. The Hopi live primarily in terraced pueblo structures, clustered into a number of independent towns, most situated on high mesas. The Hopi have generally maintained their culture, which is based on a mythology of their origin, spiritual beliefs, and a cycle of religious ceremonies. When the Spanish tried to force Christianity upon them and eliminate their traditional beliefs and kachina worship, the normally peaceful Hopi resisted. Although outside pressures have forced many Hopi to abandon their lands and lifestyle, many Hopi continue to live close to their traditional ways, farming and producing traditional craftwork: Pottery, weaving, and kachina dolls. They continue to perform the sacred ceremonies and traditional dances that are a form of prayer, asking the gods for rain, food, and the well-being of humankind. Hopi women's dance, Oraibi, Arizona. Photographed by John K. Hillers, 1879. The name Hopi is a shortened form of what they call themselves, Hopi'sinom, or "People Who Live in the Correct Way." Hopi is a concept deeply rooted in the culture's religion, spirituality, and its view of morality and ethics. To be Hopi is to strive toward this concept, which involves a state of total reverence and respect for all things, to be at peace with these things, and to live in accordance with the instructions of Maasaw, the Creator or Caretaker of Earth. In the year 1540, the Spanish inquisitor Coronado mounted an expedition to reach the golden city called Cíbola, a city reported to be of vast wealth, made of gold, and standing on a high hill. They followed the Zuni River drainage into Cíbola, in the western part of present-day New Mexico. There, he met a crushing disappointment. Cíbola was nothing like the great golden city that Marcos de Niza had described. Instead, it was just a complex of simple pueblos constructed by the Zuni Indians. 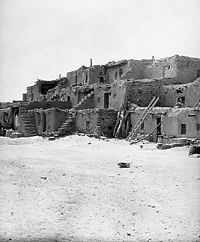 The expedition moved on to the Hopi villages, with the expectation that this region might contain the wealthy Cíbola. To the Spaniards' disappointment, materially, the Hopi region was just as poor as the Zuni. The Hopi met the Spaniards with much disdain. Over several days, however the Hopi warmed to them considerably, to the point of revealing the location of the Grand Canyon of Colorado. More Spaniards were spurred on by the notion of so much vast uncharted terrain, and dispatched missionaries to convert to Catholicism the natives they found. They were received more amicably each time. 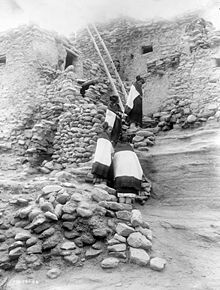 The Hopi presented the Spaniards with kilts and towels as a sign of good faith, adorned with native Hopi symbolism. Around 1629, official missionary establishments were set up all over Arizona and New Mexico, under the militant supervision of Spanish soldiers. Notable early Spanish settlements included the Walpi, Mishongnovi, and Shongopovi villages, which eventually became abandoned and then eradicated by the incensed Hopi. Tensions grew among the two cultures, and raids by the natives were not uncommon on the mission pueblos. The traditional Hopi feared conversion and the sterilization of their culture and certain martyrs and rogue bands would attack and even kill missionaries on sight at times. The Hopi managed to survive the centuries of tumult and war, and still thrive today in many parts of the southwestern states. They practice and continue to practice their traditional ceremonial culture. However, like other tribes, they have been impacted by the dominant American culture. Traditionally, the Hopi are highly skilled micro or subsistence farmers. With the installation of electricity and the necessity of having a motor vehicle and the other things which can be purchased, the Hopi have had to deal with the modern cash economy, with many people seeking and holding outside jobs as well as earning money from traditional crafts, particularly the carving and sale of Kachina dolls, highly crafted low fire pottery, and other kwaa traditional crafts such as silversmithing. The use of the language gradually declined over the course of the twentieth century. In 1990, it was estimated that over 5,000 other people could speak Hopi natively, at least 40 of them monolingual. The Hopi are known for their decorative skills in weaving, dyeing, and embroidering many textiles, such as kilts, belts, blankets, and ceremonial sashes. 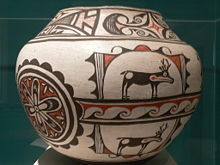 Their ceramic art has somewhat fallen by the wayside in modern times, although a fair amount of Hopi pottery can still be found among traditionalists who strive to revive the art of earlier villages. Detailed basket-weaving is still a source of pride and residual income for some Hopi, as well as other artistic mediums such as highly decorative religious masks, painted dolls, and mechanical toys. Sacred animals are revered and acknowledged in the realism of the Hopi art. The Hopi observe their traditional ceremonies for the benefit of the entire world. They must be done specifically as instructed by the katsinam or kachinas (spiritual beings), and are a time when the kachinas visit the Hopi people to see if they are "living in the correct way." If they are following the correct way, the kachinas bless them with rain and good crops. These ceremonies also give the elders access to power, which they use to keep the world in balance. Improper use of ceremonies by non-Hopi can waste this power, leading to Koyaanisqatsi or "World in Chaos" and the destruction of this, the Fourth World. The traditional Hopi are organized into matrilineal clans. When a man marries, the children from the relationship are members of his wife's clan. The child is named, however, by the women of the father's clan. On the twentieth day of a baby's life, the women of the paternal clan gather, each woman bringing a name and a gift for the child. A child can be given over forty names. The child may use any of these names or may use a non-Hopi name. A person may also change their name upon initiation into a kachina society. The sipapu is the small round hole in the floor of the kiva. The larger round hole in the floor is a fire pit. Observe that the air intake (little rectangular door in the wall), the stones that block air from the air intake, the fire pit and the sipapu are all in a line; this aspect of the design was intentional. Spider Woman, Sand Altar Woman, and other female spirits [are] conceived to be the mothers of all living things. This mother is represented in the cult by the sipapu, the opening in the floor of the underground ceremonial chamber, or kiva, for the sipapu is the womb of Mother Earth, just as it is the hole through which humankind originally emerged from the underworld. However, Hopi religion was presided over by men, as were most political functions within the villages. Most importantly, it was only men who could be initiated into the Kachina cults and perform the required dances and ceremonies which brought rain to the Hopi. For traditional Hopis, corn is the central bond. Its essence, physically, spiritually, and symbolically, pervades their existence. For the people of the mesas corn is sustenance, ceremonial object, prayer offering, symbol, and sentient being unto itself. Corn is the Mother in the truest sense that people take in the corn and the corn becomes their flesh, as mother milk becomes the flesh of the child. Plaza at Walpi on First Mesa. Photographed by John K. Hillers, 1879. The Hopi maintain a complex religious and mythological tradition stretching back over centuries. However, it is difficult to definitively state what all Hopis as a group believe. Like the oral traditions of many other societies, Hopi mythology is not always told consistently and each Hopi mesa, or even each village, may have its own version of a particular story. But, in essence the variants of the Hopi myth bear marked similarity to one another. It is also not clear that those stories which are told to non-Hopis, such as anthropologists and ethnographers, represent genuine Hopi beliefs or are merely stories told to the curious while keeping safe the Hopi's more sacred doctrines. As folklorist Harold Courlander stated, "there is a Hopi reticence about discussing matters that could be considered ritual secrets or religion-oriented traditions." David Roberts concurred that "the secrecy that lies at the heart of Puebloan [including Hopi] life…long predates European contact, forming an intrinsic feature of the culture." In addition, the Hopis have always been willing to assimilate foreign religious ideas into their cosmology if they are proven effective for such practical necessities as bringing rain. As such, it is important to note that the Hopi had at least some contact with Europeans beginning in the sixteenth century, and some believe that European Christian traditions may have entered into Hopi cosmology. 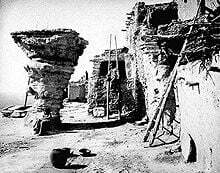 Indeed, Spanish missions were built in several Hopi villages starting in 1629, and were in operation until the Pueblo Revolt of 1680. However, after the revolt, it was the Hopi alone of all the tribes who kept the Spanish out of their villages permanently, and regular contact with whites did not begin again until nearly two centuries later. The Hopi mesas have therefore been seen as "relatively unacculturated," at least through the early twentieth century, and it may be posited that the European influence on the core themes of Hopi mythology was slight. Most Hopi accounts of creation center around Tawa, the Sun Spirit. Tawa is the Creator, and it was he who formed the First World out of Tokpella, or Endless Space, as well as its original inhabitants. It is still traditional for Hopi mothers to seek a blessing from the Sun for their newborn children. However, other accounts have it that Tawa, or Taiowa, first created Sotuknang, whom he called his nephew. Taiowa then sent Sotuknang to create the nine universes according to his plan, and it was Sotuknang who created Spider Woman, or Spider Grandmother. Spider Woman served as a messenger for the Creator and was an intercessory between deity and the people. In some versions of the Hopi creation myth, it is she who creates all life under the direction of Sotuknang. Yet other stories tell that life was created by Hard Being Woman of the West and Hard Being Woman of the East, while the Sun merely observed the process. Courlander explained that this version of the story is an attempt to amalgamate two conflicting Hopi traditions dealing with two female deities, Spider Grandmother and Huruing Wuhti ("Hard Being Woman"). Spider Grandmother has a central role in myths where the Hopi arrive in the Fourth World via the sipapu, whereas Hard Being Woman is related to Hopi legends that they arrived in the Fourth World by boat. Masauwu, Skeleton Man, was the Spirit of Death and the Keeper of Fire. He was also the Master of the Upper World, or the Fourth World, and was there when the good people escaped the wickedness of the Third World for the promise of the Fourth. Masauwu is described as wearing a hideous mask, but again showing the diversity of myths among the Hopi, Masauwu was alternately described as a handsome, bejeweled man beneath his mask or as a bloody, fearsome creature. However, he is also assigned certain benevolent attributes. One story has it that it was Masauwu who helped settle the Hopi at Oraibi and gave them stewardship over the land. He also charged them to watch for the coming of the Pahana, the Lost White Brother. Other important deities include the twin war gods, the kachinas, and the trickster Kokopelli. 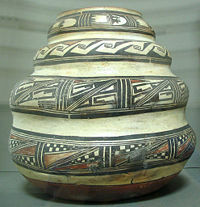 Hopi legend tells that the current earth is the Fourth World to be inhabited by Tawa's creations. The story essentially states that in each previous world, the people, though originally happy, became disobedient and lived contrary to Tawa's plan; they engaged in sexual promiscuity, fought one another, and would not live in harmony. Thus, the most obedient were led (usually by Spider Woman) to the next higher world, with physical changes occurring both in the people in the course of their journey, and in the environment of the next world. In some stories, these former worlds were then destroyed along with their wicked inhabitants, whereas in others the good people were simply led away from the chaos which had been created by their actions. Two main versions exist as to the Hopi's emergence into the present (or Fourth) world. The more prevalent is that Spider Grandmother caused a hollow reed (or bamboo) to grow into the sky, and that it emerged in the Fourth World at the sipapu. The people then climbed up the hollow tube into this world. Typically, the location of the sipapu is given as in the Grand Canyon which is fairly near to the Hopi mesas. The other version (mainly told in Oraibi the oldest of the Hopi villages) has it that Tawa destroyed the Third World in a great flood. Before the destruction, Spider Grandmother sealed the more righteous people into hollow reeds which were used as boats. Upon arriving on a small piece of dry land, the people saw nothing around them but more water, even after planting a large bamboo shoot, climbing to the top, and looking about. Spider Woman then told the people to make boats out of more reeds which grew from the bamboo shoot, and using island "stepping-stones" along the way, the people sailed east until they eventually arrived on the mountainous coasts of the Fourth World. Courlander wrote that little children are often told the story of the sipapu, but the story of an ocean voyage is related to them when they are older. Upon their arrival in the Fourth World, the Hopis divided and went on a series of great migrations throughout the land. Sometimes they would stop and build a town, then abandon it to continue on with the migration. However, they would leave their symbols behind in the rocks to show that the Hopi had been there. Long the divided people wandered in groups of families, eventually forming clans named after an event or sign that a particular group received upon its journey. These clans would travel for some time as a unified community, but almost inevitably a disagreement would occur, the clan would split and each portion would go its separate way. However, as the clans traveled, they would often join together forming large groups, only to have these associations disband, and then be reformed with other clans. These alternate periods of harmonious living followed by wickedness, contention, and separation play an important part of the Hopi mythos. In the course of their migration, each Hopi clan was to go to the farthest extremity of the land in every direction. Far in the north was a land of snow and ice which was called the Back Door, but this was closed to the Hopi. However, the Hopi say that other peoples came through the Back Door into the Fourth World. 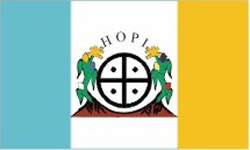 The Hopi clans also passed through the tropics in the south, and today many Hopis regard the Aztecs, Mayas, and other Central and South American Indian groups as renegade Hopi clans that never finished their appointed migrations. The Hopi were led on their migrations by various signs, or were helped along by Spider Woman. Eventually, the Hopi clans finished their prescribed migrations and were led to their current location in northeastern Arizona. Jacob Hamblin, a Mormon missionary who first visited the Hopi in 1858, records a tradition that the Hopi were brought to their mesas by three prophets, and were not to cross the Colorado River to the west until these prophets had returned again. The idea that the Hopi were not to cross the Colorado or Rio Grande Rivers without permission is echoed in Frank Waters' work, although without mention of "three prophets." Hopi tradition tells of sacred tablets which were imparted to the Hopi by various deities. The most important was said to be in the possession of the Fire Clan, and is related to the return of the Pahana. In one version, an elder of the Fire Clan worried that his people would not recognize the Pahana when he returned from the east. He therefore etched various designs including a human figure into a stone, and then broke off the section of the stone which included the figure's head. This section was given to Pahana and he was told to bring it back with him so that the Hopi would not be deceived by a witch or sorcerer. Another version has it that the Fire Clan was given a sacred tablet by Masauwu, who as the giver of fire was their chief deity. In this version the human figure was purposely drawn without a head, and a corner of the stone was broken off. Masauwu told them that eventually the Pahana would return bringing the broken off corner of the stone, but if in the mean time a Hopi leader accepted a false religion, he must assent to having his head cut off as drawn on the stone. This same story holds that three other sacred tablets were also given to the Hopi. These were given to the Bear Clan by their patron deity Söqömhonaw, and essentially constituted a divine title to the lands where the Hopi settled after their migrations. The third of these was etched with designs including the sun, moon, stars, and clouds on one side with six human figures on the other. Frank Waters claims that he was shown this third tablet in Oraibi in 1960. He describes the stone as "approximately 10 inches long, 8 inches wide, and 1 1/2 inches thick. The stone resembled a dull gray marble with intrusive blotches of rose." The physical existence of such a stone is substantiated by a few other sources. The true Pahana (or Bahana) is the "Lost White Brother" of the Hopi. Most versions have it that the Pahana or Elder Brother left for the east at the time that the Hopi entered the Fourth World and began their migrations. However, the Hopi say that he will return again and at his coming the wicked will be destroyed and a new age of peace will be ushered into the world. As mentioned above, it is said he will bring with him a missing section of a sacred Hopi stone in the possession of the Fire Clan, and that he will come wearing red. Traditionally, Hopis are buried facing eastward in expectation of the Pahana who will come from that direction. The legend of the Pahana seems intimately connected with the Aztec story of Quetzalcoatl, and other legends of Central America. This similarity is furthered by the liberal representation of Awanyu, the horned or plumed serpent, in Hopi and other Puebloan art. This figure bears a striking resemblance to figures of Quetzacoatl, the feathered serpent, in Mexico. In the early sixteenth century, both the Hopi and the Aztecs seem to have believed that coming of the Spanish conquistadors was in fact the return of this lost white prophet. However, unlike the Aztecs, upon first contact the Hopi put the Spanish through of series of tests in order to determine their divinity, and having failed, the Spanish were sent away from the Hopi mesas. Tovar [the leader of the Spanish] and his men were conducted to Oraibi. They were met by all the clan chiefs at Tawtoma, as prescribed by prophecy, where four lines of sacred meal were drawn. The Bear Clan leader stepped up to the barrier and extended his hand, palm up, to the leader of the white men. If he was indeed the true Pahana, the Hopis knew he would extend his own hand, palm down, and clasp the Bear Clan leader's hand to form the nakwach, the ancient symbol of brotherhood. Tovar instead curtly commanded one of his men to drop a gift into the Bear chief's hand, believing that the Indian wanted a present of some kind. 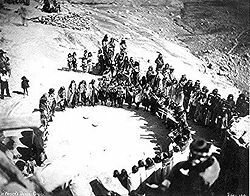 Instantly all the Hopi chiefs knew that Pahana had forgotten the ancient agreement made between their peoples at the time of their separation. Nevertheless, the Spaniards were escorted up to Oraibi, fed and quartered, and the agreement explained to them. It was understood that when the two were finally reconciled, each would correct the other's laws and faults; they would live side by side and share in common all the riches of the land and join their faiths in one religion that would establish the truth of life in a spirit of universal brotherhood. The Spaniards did not understand, and having found no gold, they soon departed. Historically speaking, the kachina cult long predates European contact, and traces of the religion have been found which date to as early as 1325 C.E. However, it remains an open question among scholars as to whether the kachina religion was an indigenous creation, or an import from Mexico. The similarity of many aspects of Hopi religion to that of the Aztecs to the south strongly suggest the latter. For example, the Hopi horned or plumed serpent Awanyu uncannily resembles the Aztec Quetzecoatl, as does the Hopi legend of the Pahana. The Hopi say that during a great drought, they heard singing and dancing coming from the San Francisco Peaks where the Kachinas are said to live. Upon investigation, they met the Kachinas who returned with the Hopi to their villages and taught them various forms of agriculture. The Hopi believe that for six months out of the year, the Kachina spirits live in the Hopi villages. It is during this time that Kachina or masked dances are held. In these, Hopi men dress in masks which represent the Kachinas, and in fact, it is believed that while masked, these men are the embodiment of the Kachina spirits. After the Home Dance in late July or early August, the Kachinas return to the San Francisco Peaks for six months. The Hopi believe that these dances are vital for the continued harmony and balance of the world. It serves the further and vital purpose of bringing rain to the Hopi's parched homeland. Among the Hopi, Kachina dolls are traditionally carved by the uncles and given to uninitiated girls at the Bean Dance (Spring Bean Planting Ceremony) and Home Dance Ceremony in the summer. The function of the dolls is to acquaint children with some of the many Kachinas. Initiation into Hopi society is intimately tied to the Kachinas. Children are initiated into society at the age of seven or eight years old in a ceremony called Kachinvaki. Up until this point, they have been led to believe that the Kachina dancers in the village are truly magical spirits, rather than just men in masks. The children are taken by their godparents into the village kiva. After climbing down the ladder into the kiva, the child steps into a hoop which is raised and lowered over the child four times. Then, a story teller explains to the children the beginning of the Kachinas and the purpose they serve. They are then initiated through different ceremonies including whippings with yucca. Kokopelli and Kokopelli Mana as depicted by the Hopi. The mysterious Kokopelli is found in a number of Native American cultures, representing a mischievous trickster or the Minstrel, spirit of music. Kokopelli is distinguished by his dancing pose, a hunchback, and flute. He is considered a symbol of fertility who brought well-being to the people, assuring success in hunting, planting and growing crops, and human conception. Kokopelli often displayed a long phallus, symbolizing the fertile seeds of human reproduction. His whimsical nature, charitable deeds, and vital spirit give him a prominent position in Native American mysticism. Kokopelli remains revered by current-day descendants of the Hopi, as well as other pueblo peoples. The Hopi continue to sustain themselves through a variety of agricultural production, with maize being their primary cash crop. A small amount of the cereal produced in the western world can be attributed to Hopi farms. Other notable crops include pumpkins, beans, melons, sunflowers, cotton, wheat, and tobacco. The Hopi are also shepherds of sheep (estimated at 56,000 in the first decade of the twentieth century) and goats, which were originally acquired through barter with the Spanish. Cattle, horses, and mules are regularly incorporated into their agricultural industry, and small desert animals are consumed as delicacies. Community hunts for small and large game are fairly common still, and are executed with wooden boomerangs, pitfalls made out of stones, booby trap snares, and modern rifles. A few Hopi live on the Colorado River Indian Reservation on the Colorado River in western Arizona. 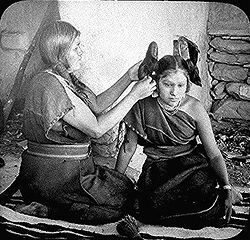 The Hopi have been affected by missionary work carried out by several Christan denominationss and also by consumerism and alcoholism. However, Hopi still practice the complete cycle of traditional ceremonies. These ceremonies are centered around a religious calendar and are observed in all the Hopi villages. ↑ Ake Hultkrantz, The Religion of the Goddess in North America (Crossroad Publishing Co., 1990). ↑ Dennis Wall and Virgil Masayesva, "People of the Corn: Teachings in Hopi Traditional Agriculture, Spirituality, and Sustainability," American Indian Quarterly, Summer/Fall 2004: 435-453. ↑ Christopher Vecsey, "The Emergence of the Hopi People," in American Indian Quarterly 7(3): 70. ↑ Harold Courlander, The Fourth World of the Hopis: The Epic Story of the Hopi Indians as Preserved in their Legends and Traditions, (University of New Mexico Press, 1987). ↑ David Roberts, The Pueblo Revolt (Simon and Schuster, 2004). ↑ Susan E. James. 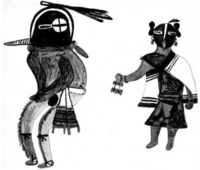 "Some Aspects of the Aztec Religion in the Hopi Kachina Cult," Journal of the Southwest (2000). ↑ David Roberts, The Pueblo Revolt, 48. ↑ Harold Coulander, The Fourth World of the Hopis: The Epic Story of the Hopi Indians as Preserved in their Legends and Traditions (University of New Mexico Press, 1987). ↑ 9.0 9.1 Louise Udall, Me and Mine: The Life Story of Helen Sekaquaptewa (University of Arizona Press, 1969). ↑ Frank Waters, The Book of the Hopi (Penguin Books, 1963). ↑ H.R. Voth. The Traditions of the Hopi (Chicago: 1905). ↑ Harold Courlander, The Fourth World of the Hopi, 205. ↑ Harold Coulander, The Fourth World of the Hopis, 22. ↑ Hamilton A. Tyler, Pueblo Gods and Myths (University of Oklahoma Press, 1964). ↑ Dan Kotchongva, "Where is the White Brother of the Hopi Indian?" in Improvement Era (1936). ↑ Harold Courlander, The Fourth World of the Hopis, 205. ↑ Harold Courlander, The Fourth World of the Hopi, 35. ↑ Frank Waters, The Book of the Hopi, 31-122. ↑ Jacob Hamblin, Jacob Hamblin: A Narrative of His Personal Experience (1881): 163-64. ↑ 21.0 21.1 21.2 Frank Waters, The Book of the Hopi, 33. ↑ Harold Courlander, The Fourth World of the Hopi, 31. ↑ James H. McClintock, Mormons Settlement in Arizona, 81-82. ↑ Harold Coulander, The Fourth World of the Hopis, 31. ↑ Susan E. James, Some Aspects of the Aztec Religion in the Hopi Kachina Cult, Journal of the Southwest (2000). ↑ Raymond Friday Locke, The Book of the Navajo (Hollaway House, 2001). ↑ Harold Courlander, The Fourth World of the Hopis, 176. ↑ Frank Waters, The Book of the Hopi, 252. ↑ David Roberts, The Pueblo Revolt, 36. Allen, Paula Gunn. The Sacred Hoop: Recovering the Feminine in American Indian Traditions. Boston: Beacon Press, 1992. ISBN 978-0807046173. Courlander, Harold. The Fourth World of the Hopis: The Epic Story of the Hopi Indians as Preserved in Their Legends and Traditions. University of New Mexico Press, 1987. ISBN 978-0826310118. Dozier, Edward. The Pueblo Indians of North America. Waveland Press, 1983. ISBN 978-0881330595. Hultkrantz, Ake. “The Religion of the Goddess in North America,” The Book of the Goddess Past and Present: An Introduction to Her Religion Waveland Press, 2002. ISBN 978-1577662730. McLeod, Roxie. Dreams and Rumors: A History of "Book of the Hopi" Thesis (M.A.) University of Colorado, 1994. MLA. Page, Susanne, and Jake Page. Hopi. Harry N. Abrams, 1994. ISBN 978-0810981270. Waldman, Carl. 2006. Encyclopedia of Native American Tribes. Checkmark Books. ISBN 978-0816062744. Wall, Dennis, and Virgil Masayesva, “People of the Corn: Teachings in Hopi Traditional Agriculture, Spirituality, and Sustainability.” American Indian Quarterly. Summer/Fall 2004, Vol. 28, Issue ¾: 435-453. "Hopi Indians". Catholic Encyclopedia. (1913). New York: Robert Appleton Company. This page was last modified on 13 January 2018, at 23:54.